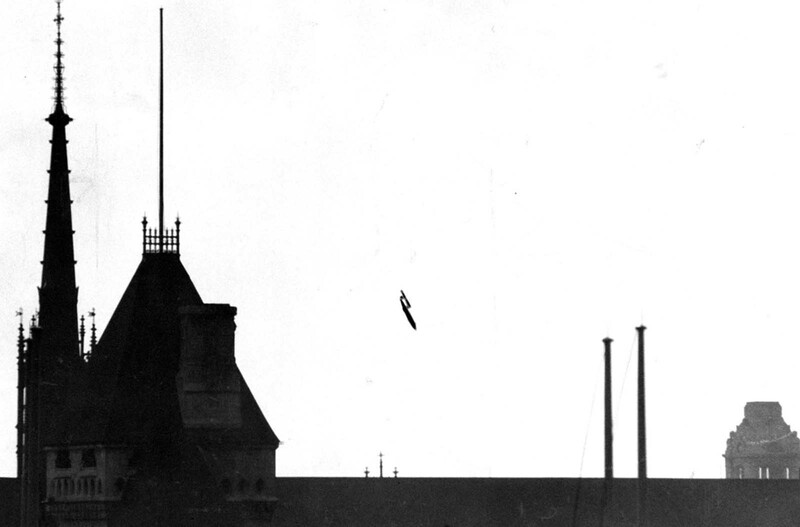 A V-1, “buzz bomb”, plunging toward central London, 1945. This bomb landed on a side road off Drury Lane blasting several buildings, including the office of the Daily Herald. Known as the Flying bomb, Buzz bomb or Doodlebug, V-1 was the first modern guided missile used in wartime and the forerunner of today’s cruise missile. The V-1 (and later V-2 ) added a new terror to an already terrible war – robot missiles. Once launched, these weapons flew without human intervention to strike distant targets. In June, 1942, Nazi Germany began working on a new secret weapon. The name Vergeltungswaffe, meaning “Vengeance weapon”, was coined by German propaganda minister Goebbels to signify reprisals against the Allies for the mass bombing of urban areas in Germany. The V-1 was a pilotless monoplane that was powered by a pulse-jet motor and carried a one ton warhead. They were launched from a fixed ramp and traveled at about 350 mph and 4,000 feet (1,200 meters) and had a range of 150 miles (240 km). It was 8 meters (25 feet) long and had a wingspan of about 5.5 meters (20 feet). The British intelligence first became aware of this new weapon when on 22nd August, 1942, a Danish naval officer discovered an early test version that had crash landed on a small island between Germany and Sweden. The officer sent a photograph and a detailed sketch of the bomb to Britain and preparations began to deal with this new weapon that had the potential to win the war for Germany. The British used to destroy these bombs using a fighter plane, which were faster than the V1’s and could fly above the weapon before descending to attack it. The pilots usually slipping a wing of the plane under the wing of the missile, then they would flip their wing up which would throw off the stabilizing gyros in the missile and make it crash. This was more preferable than simply shooting V-1’s due to their tendency to explode right away when they were shot. The last V-1 attack struck British soil on March 29, 1945, two days after the final V-2 attack. Almost 30,000 V-1’s were made. Approximately 10,000 were fired at England; 2,419 reached London, killing about 6,184 people and injuring 17,981. Very few V1s were downed by tipping their wing over - almost all were either shot down by anti-aircraft guns before they got to the coast, or were shot down by mostly Tempest or Mosquito aircraft.